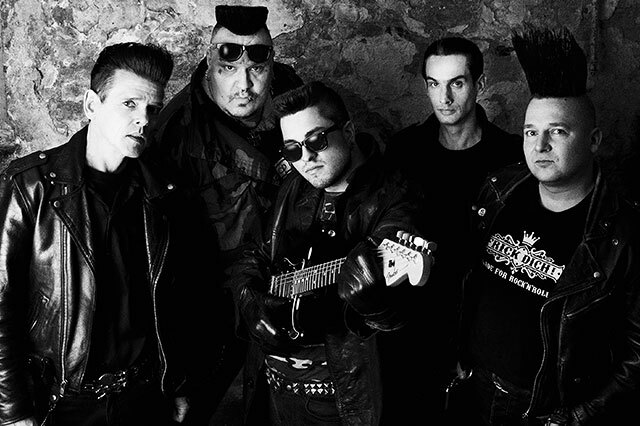 MAD SIN were born in 1987 out the hard rockin’ street fighting, heavy drinking, seedy gutter of the rockabilly/punk underworld that flourished in a Berlin still entombed by the Eastern Bloc. Not even the Iron Curtain could stop the spread of the sickness that spewed from the first incarnation of the band, Koefte, Stein and Holly when they blasted headlong into the thriving European Psychobilly scene with their first full length album “Chills and Thrills”. 25 years on and 10 albums later the band have grown from the angry psychobilly trio playing squats and back rooms of dingy bars to a full-sized chart-bothering multi-genre embracing globe-trotting behemoth of a band. MAD SIN now happily straddle festival stages looking the crowd straight in the eyes just as they did in 1987 though are still as eager to dive headlong into the audience at a club gig as if the past quarter century had never happened.